Littleton Middle School seventh-graders focus during their “Hour of Code’’ session. Twelve-year-old Kevin Murphy of Littleton fell in love with computer programming in just an hour earlier this month, and now sees a career path he never knew existed. 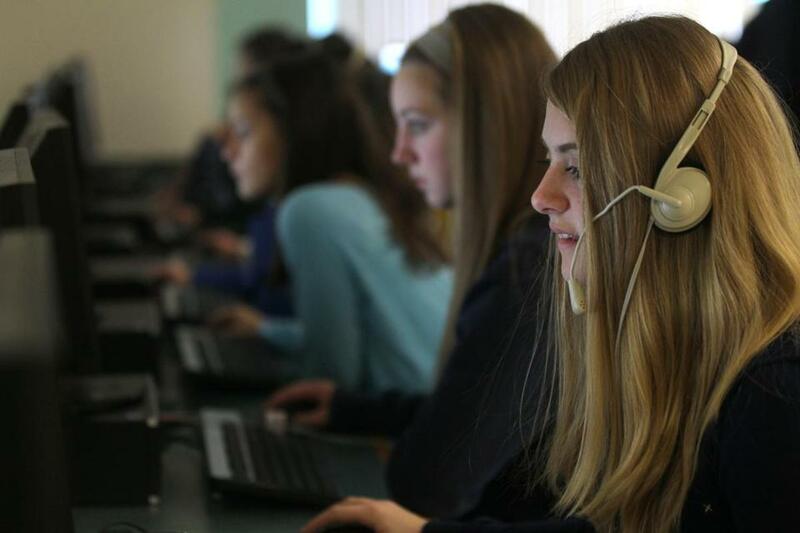 Littleton Middle School was one of about 200 schools in Massachusetts that participated in “Hour of Code,’’ a nationwide campaign to help introduce millions of students to programming during Computer Science Education Week. During the 60-minute event, sponsored by education nonprofit Code.org, Murphy and the other students wrote a program to make an online greeting card. Littleton seventh-grader Christina Tsillas shares her “Hour of Code’’ project with (from left) school board member Alex Pratt and school principals Scott Bazydlo and Mark Branco. The participants included nearly two dozen area school districts, according to the Massachusetts Computing Attainment Network, with Acton, Ashland, Bedford, Bolton, Brookline, Concord, Framingham, Franklin, Groton-Dunstable, Harvard, Holliston, Lexington, Marlborough, Maynard, Medway, Natick, Needham, Newton, Sudbury, Wayland, Wellesley, and Weston making its list. Code.org says the Hour of Code is designed to demystify computer science by taking students through introductory tutorials that can be completed online, on a smartphone, or even unplugged. During Computer Science Education Week, observed Dec. 9-15, roughly 15 million students in 170 countries were introduced to the basics of writing code, organizers said, and more girls participated in computer science in US schools over the seven days than in the last 70 years. And students are still flocking online to www.code.org and learning to write code. More than 20 million students have done an hour of code and written 668,008,671 lines of code. Local groups are hoping to build on the buzz generated during the Hour of Code event as they continue to push for more computer science education in schools. Amid predictions that there will be 1 million more jobs in computer-related fields than students by 2020, nine out of 10 schools don’t offer programming courses, according to Code.org. In 33 of the nation’s 50 states, including Massachusetts, computer science courses do not count toward the math or science requirements for a high school diploma. “Computer science is such a critical component of innovation economies around the globe that it’s essential that we really prepare and motivate and inspire a much larger number of students to see the opportunities in computer science careers,’’ said Stanton. MassCAN is a coalition of organizations collaborating to “inspire and educate Massachusetts students in computing,” with its members including educational nonprofits, business associations, corporations, and educational institutions. Stanton said the group, which was formed earlier this year, will be making a major announcement next month and rolling out a series of initiatives to help advance its cause. “We’re doing a lot of homework and preparing a set of action plans that will enable us to recruit a cross-section of folks from K-to-12 education, higher education, the business community, and nonprofit sector to begin taking some specific and concrete steps in the areas of state standards, curriculum, teacher professional development, and public awareness,’’ he said. 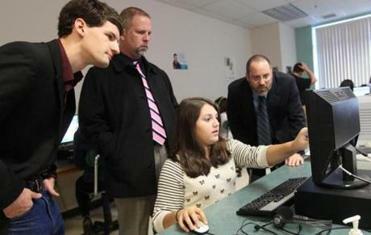 Duxbury public school officials said they are well aware of the need to provide their students with more computer-programming skills, and are making strides toward that goal. Cheryl Lewis, the district’s science supervisor for grades 6 through 12, said the Hour of Code tied in well with Duxbury’s strategic plan to offer more computer science and engineering instruction to all students. Duxbury is implementing a one-on-one laptop program that will allow coding to be done on a regular basis, Lewis said. All high school students will have laptops next year, and officials hope to expand it into the middle school. “With next fall’s implementation with one-to-one, we believe we will be close so that every child will be able to code during the school day in an activity in their math and science classes as it’s written into the curriculum,’’ Lewis said. Littleton will also be among the school districts doing more coding next year. The middle school was selected as one of 50 schools nationwide and the only one in Massachusetts to receive a $10,000 award from Code.org. The money will be used to design and implement a center-based programming and engineering computer lab. The lab will include three centers representing a different platform: Chrome, Apple, and Windows. Through the centers, the students will learn coding methodology, computer science techniques, and engineering design skills by developing apps, games, a variety of digital media, and robotic projects, said principal Mark Branco. “The lab will provide students with authentic learning experiences that will begin to educate them about, and prepare them for, future educational experiences’’ and careers in STEM — science, technology, engineering, and math — fields, Branco said. Kelly Powers, copresident of the Computer Science Teachers Association of Greater Boston, and chairwoman of the computer science department for sixth through eighth grades at the Advanced Math & Science Academy Charter School in Marlborough, said every district has obstacles to overcome when it comes to offering computer science classes. For some it’s a lack of funding; for others it’s about professional development. Powers said while there is clearly job growth in computer programming, the skills that students learn in those classes translate to all fields. Powers is working on the national, state, and local levels to increase access to the subject in schools, and is hopeful that groups like Code.org and MassCAN are making a difference. Students at schools that don’t offer computer science courses, Powers said, can still take advantage of tutorials online. Code.org has activities for students and an introductory course for students in kindergarten through Grade 8 that educators can offer in a classroom, as an after-school activity, or even in a club outside school. Powers said she is also available to help teachers around the state get started and get connected with other groups and businesses working toward the same goal; she can be reached at kelpowers@gmail.com. Reach Jennifer Fenn Lefferts at jflefferts@yahoo.com.